Learn more about Ken and his work below. 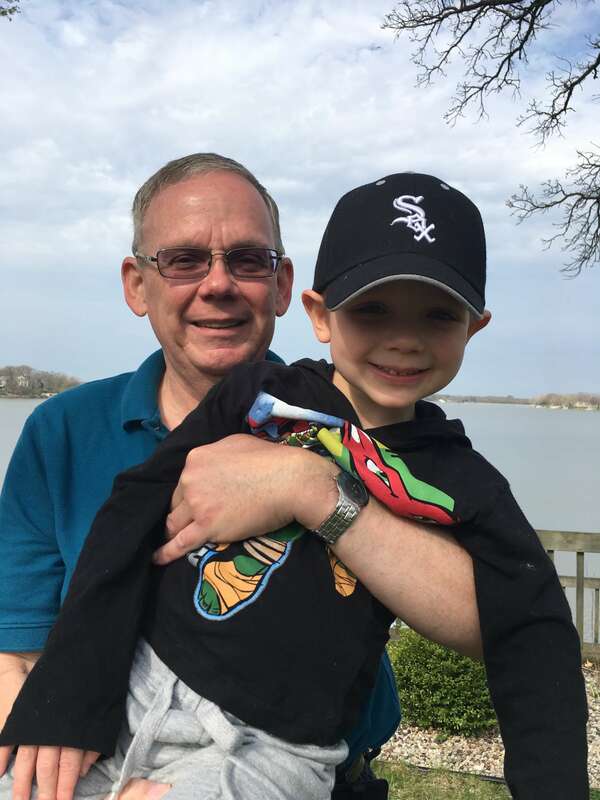 Meet Ken Lavelle, with his grandson, Nathan. Our crisis services Volunteer of the Month of May 2016, is frontline team member (a.k.a. “liner”) and NRS board member, Ken Lavelle. I’m really very humbled to be considered for the Volunteer of the Month. There are so many great volunteers that do so much. Ken has helped the agency in a number of ways: serving as a dedicated ‘liner’ in the crisis services center, and a member of our board, assisting in fundraising efforts and spreading awareness of our agency. Let’s learn more about Ken and why he chooses to support NRS. I’m a grandfather and marathon runner, hope to be ready for Chicago [Marathon] again in 2016. I was introduced to the NRS by Ron* and Anne Schankin, two of our outstanding volunteers! They had such good things to say and were so positive I just had to learn what it all was about. So, I scheduled a tour, met Maureen, and knew I had to do more. So many reasons. At NRS, I can contribute, and feel I can really help youth in need at critical times in their lives. NRS is exceptionally well managed, with so many great people. Volunteering at NRS is completely motivating and energizing for me. The training we get at NRS is incredibly good, every shift at the NRS I learn. There are so many unique situations we have to deal with and (we receive) incredible support from the supervisors. The whole of the experiences has helped me center myself and develop better patience, tolerance, and counseling skills I use every day. We congratulate Ken on this distinction and cannot thank him enough for his support and dedication. Learn more about Ken’s unique experiences helping youth considering running away from home. If you are considering volunteering at NRS and live in the Chicagoland area, apply here.